I feel like basketball players are evaluated by three broad metrics: classic statistics, advanced metrics, and the eye test. Toppin had decent baseline stats: about 14 points, 6 rebounds, and 2 assists per game. He’s shooting almost 70% from the field, tops in the league. These are great numbers from a freshman but very atypical numbers for someone who deserves to be in the player of the year of the conversation. But man does Toppin look impressive based on the other categories. His offensive rating is approaching 125 and his defensive rating is under 100 (high is good for offense, and low good for defense). He may finish with the best box plus minus of any player in the conference, and at this point there probably is no better single measure of performance we have (not that it’s perfect). The eye test is also clear. Toppin is 6’9 with NBA athleticism; he’s not on the level of Aaron Gordon but there are definitely similarities between the two. He has high basketball IQ: Toppin is clever about creating space, passing out of double teams, and knowing when to be aggressive and when to defer. While I would not pick him for Player of the Year, he should be on the first team all conference ballot. 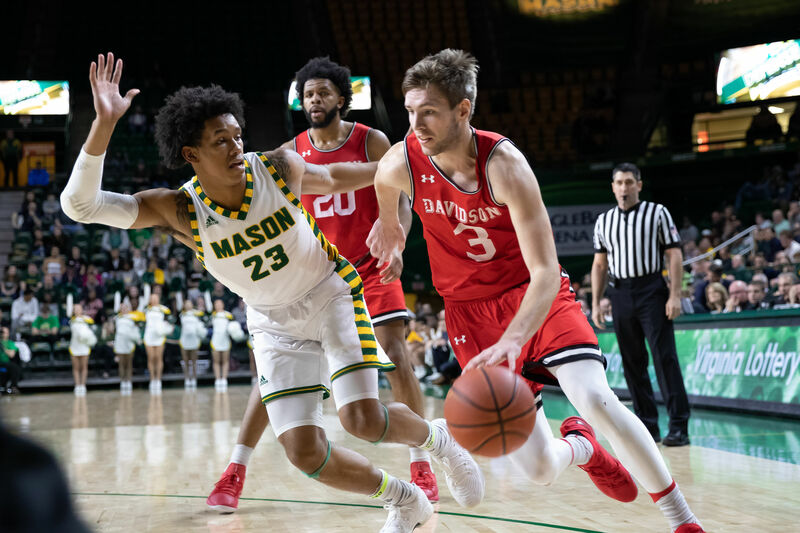 Against Dayton, JAG exploded for 21 second half points to lead Davidson’s furious comeback that came up one point short. He made big play after play , and finished with 26 points, 8 boards, and five assists. Whereas Toppin does well in two of the three broad categories, Jon Axel passes the eye test, has excellent classical numbers, and looks great according to the advanced metrics. He has hit big shot after big shot this year for Davidson, and never seems afraid of the moment. In Davidson’s third game, he scored 33 of the team’s 57 points in an ugly victory over Wichita State. He also hit the winning free throws against Saint Louis with seconds remaining, and led the team’s comeback tonight. The numbers are also impressive. He is the sole player who is top 10 in the conference in scoring, rebounding, and assists. He is a feisty if not flashy defender, and advanced metrics suggest he is uniquely valuable on that side of the ball for a guard. His box plus minus is near the top of the league. This is almost blindingly obvious at this point, but this game highlighted these obvious points. There is absolutely no team that can match the Toppin-Cunningham combination on the inside and Ryan Mikesell is a great compliment. There is a legitimate argument Cunninham and Toppin are the two best big men in the conference. Similarly, with Gudmundsson and Grady, there is a legitimate argument that Davidson has the two best guards in the conference. Luke Frampton is also incredible and absolutely vital to the Wildcats success. While I am guessing that Marcus Evans sneaks in to a first team slot over Grady, there are definitely arguments Grady has been the second best guard in conference despite some of his struggles. He showed some flashes to returning to peak form tonight; here’s to hoping he pulls it off. (Aside: VCU has been great because it has a very good backcourt and frontcourt). For 30 minutes, Davidson struggled mightily against Dayton’s big men. Luke Brajkovic and Bates Jones were simply too slow to keep up with Toppin and Cunningham, who were the same height but much faster and stronger. Combined Brajkovic and Jones had 9 fouls, three turnovers, and two points. Davidson then went super small for a few minutes with Kishawn Pritchett playing as a nominal center surrounded by four guards. I give credit to Bob McKillop for trying the counterintuitive move, but it didn’t work. Toppin dominated. Enter Dusan Kovacevic. While far from a crazy athlete, he moves much more fluidly than Brajkovic or Jones. This helped slow down Toppin and Cunningham. He didn’t take a three and is shooting under 30 percent from deep, but he at least needs to be covered out there. This created drving space for Gudmundsson and Grady, and allowed Kovacevic to break out his nifty spin move several times. He deserves more minutes down the stretch. If Brajkovic is struggling with the athleticism of his opponent as he has against Osun Osuniyi, Hasahn French, and Obi Toppin, then Kovacevic should get the majority of the minutes. As a Davidson fan, I feel like I can take a breather. The Wildcats have been in this uncomfortable place on the edge of the bubble for most of the season. I can’t see a way for them to get an at-large at this point. This is frustrating, but I was still happy with the way the Cats clawed back into a tie game with seconds to go after being down 19. Dayton did the same exact thing before falling short to VCU by a point at home, and look at how they are feeling after tonight. Dayton certainly deserves a lot of credit for going in to Belk in getting a win. But it shot above its season averages from the line and behind the arc. A sub 60% shoot hit 9 of 10 from the line including the game winning free throw. Davidson by contrast shot an uncharacteristic 6 of 21 from deep. Grady, Gudmundsson, and Frampton were a combined 3 of 14. Again, credit here goes to Dayton. But I would expect these numbers to make the small but significant reversion to the mean if these teams meet again. Both teams need to focus on teams in front of them. But as an A-10 fan, I’m ready things to be decided at the Barclays Center. I agree with most of this. Toppin is so quick and a definite 1st round pick. Gudmundsson and Grady are the best guards in th A10. Teams with athletic front line players give Davidson a lot of problems. A poor 1st half 28% fg pct. missing layups put them in catchup mode the rest of the night. That win last night put Dayton back in the running for an at large bid.